Achtung! Cthunhu brings you a two-fisted wartime roleplaying game setting packed full of fiendish nazis, terrifying ancient mysteries, legendary war machines, and enough writhing tentacles to fill ten Reichstags. 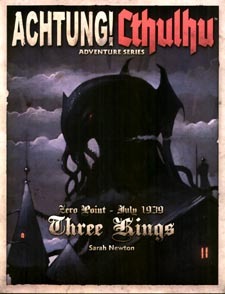 Three Kings is the first in a series of standalone adventure supplements in the globe-spanning Zero Point campaign for Achtung! Cthulhu. Join a band of heroic soldiers, agents, and partisans behind enemy lines on the eve of World War Two, as they discover the unspeakable horrors of Castle Karistein in occupied Czechoslovakia!